I am pulling my hair out. I am sure that this has been questioned many times and I have been googling for many days and just couldn't find proper solutions and instructions. Ping FS01 from WS08 and versus. Ping FS02 from FS01 and versus. 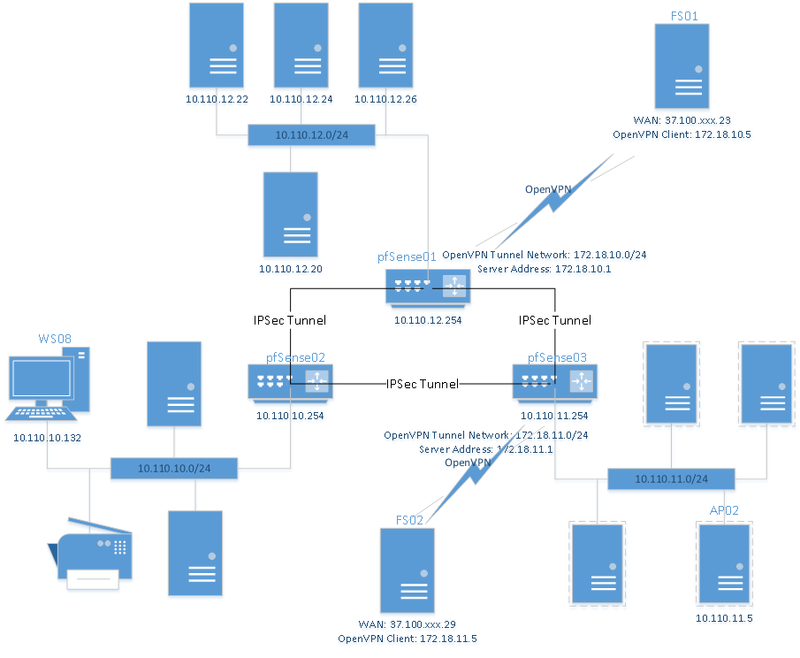 I just couldn't figure out how to make pfsense to route my packets from OpenVPN clients to another subnets. I have Host B1 communicating with Host C1 over the tunnels. Is that what you're looking for? IPSec tunnel between any two of pfSense firewalls. BTW, I have tried to add IPSec phase 2 entry with openvpn IP pool. For example, I created p2 entries of 172.18.10.0/24 to pfSense02 and pfSense03. Oct 19 09:32:59 racoon: ERROR: ip.wan.pfSense02 give up to get IPsec-SA due to time up to wait. Oct 19 05:22:11 racoon: ERROR: failed to get sainfo. Oct 19 05:22:11 racoon: [pfSense02]: [ip.wan.pfSense02] ERROR: failed to pre-process ph2 packet [Check Phase 2 settings, networks] (side: 1, status: 1). Oct 19 05:22:21 racoon: ERROR: failed to get sainfo. Oct 19 05:22:21 racoon: [pfSense02]: [ip.wan.pfSense02] ERROR: failed to pre-process ph2 packet [Check Phase 2 settings, networks] (side: 1, status: 1). Oct 19 05:22:31 racoon: ERROR: failed to get sainfo. Oct 19 05:22:31 racoon: [pfSense02]: [ip.wan.pfSense02] ERROR: failed to pre-process ph2 packet [Check Phase 2 settings, networks] (side: 1, status: 1). Finally, I got the solution!! !